Posted on November 23, 2012 by Eastwood Eagles | Comments Off on Ethan’s writing! Comments Off on Ethan’s writing! 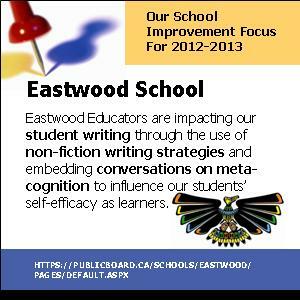 Posted on November 23, 2012 by Eastwood Eagles | Comments Off on Kate reads The Classroom! Comments Off on Kate reads The Classroom! With much momentum in the area of reading and writing and based on the needs of our student body we decided as a professional staff to plan all of our learning around Non-Fiction Writing and Metacognition skills this academic year. Metacognition = when students share the thinking about their thinking. When they can articulate how they arose at a solution, resolution or problem and the thinking that helped get them there. Self-Efficacy = a students sense of ability or the combination of resilience and accomplishment. When a student knows that it was their thinking, effort and work that lead to deeper learning and achievement. What did you know about your audience that informed your planning process? What strategy did you find most helpful for organizing your information? What editting strategies are most helpful for you? If you have any further questions regarding our focused work this school year please see you Eastwood Teacher for help. We would love to help you help your children at home! McKena reads Come, Sit, Speak! Posted on November 19, 2012 by Eastwood Eagles | Comments Off on McKena reads Come, Sit, Speak! Comments Off on McKena reads Come, Sit, Speak! 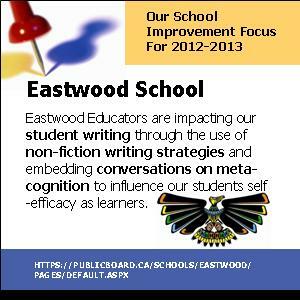 Posted on November 14, 2012 by Eastwood Eagles | Comments Off on Helen reads! Comments Off on Helen reads! Posted on November 2, 2012 by Eastwood Eagles | Comments Off on Draw Something? Comments Off on Draw Something?